"He's just big boned," you may tell yourself if you look at your Yorkie and think he's looking a bit . . . fluffy. It's important to be honest when you look at your dog and assess his body condition. 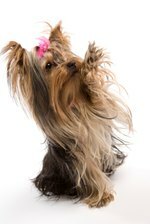 Maintaining the right weight for your Yorkie isn't all about looking good, it's also about keeping him healthy. According to the American Kennel Club, the proper weight range for a Yorkshire terrier is between 4 and 7 pounds. A healthy Yorkie walking in the grass. According to the American Kennel Club's standard for the Yorkshire terrier, he should weigh between 4 and 7 pounds. If you don't have a scale, PetMD provides guidelines to help you eyeball your pup's body condition. Ideally, you should be able to feel your Yorkie's ribs and spine, but not see them. What you should see is a bit of a narrowing of the waist when you look down at him. When his waist begins to disappear, or his ribs and spine aren't discernible by touch, he's probably carrying an extra few ounces. He's starting to thin out too much if his waist is obvious from your bird's-eye view and you can easily feel his spine, ribs and other bones. A little extra time on your walks and cutting down on the dog treats can make a difference if your Yorkie's a tad overweight. If he's a little under where he should be, he'll likely appreciate an extra biscuit here and there, or a bit more in his food dish. Since the Yorkie has a small weight window, it's best to discuss his diet and treat intake with your vet to determine what's right for your pup. If your dog is severely underweight or obese, you should consult with your vet to ensure he doesn't have a health issue and come up with the right diet for your Yorkie.